SUPERWANI: For Vanilla and Peppermint and Saidah! Another bestie of mine is pregnant!! two brides of SajenTwo (my dorm during my stay in SAMURA) also brides of 2010 dh preggy. They are Faie and Ida. I pray the best for both of you. I love you all..Take care. See u with baby bumb in a few months!! wani.. thank you for the wish and prayers. InsyaAllah dalam end of april or early may baby nie keluar. do take care of yourself kat jepun. 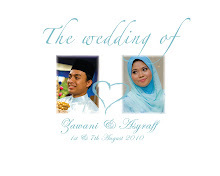 p/s: phd aku postpone maybe by end of 2011 due to pregnancy. paie:dont mention it. u derserve lots an lots of wishes n prayers.yey! !thn dpn sebok sambut baby pule..we r indeed growring togede dont we? ?tangguh eh? ?its ok paie.uve got nothing to lose pon.take care.jgn lasak2.